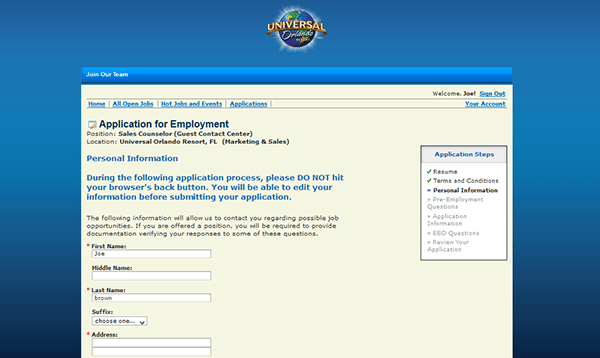 Learn how to access the Universal Studios job application by following the instructions in the below guide. 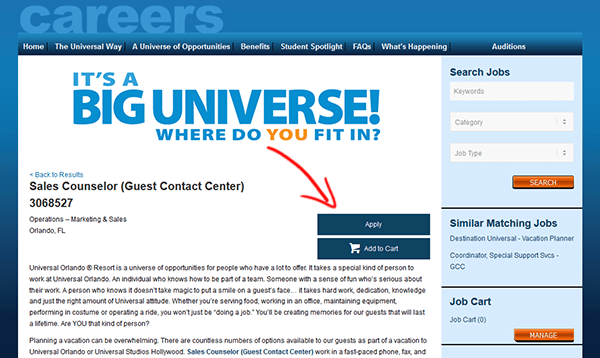 The guide details the online job search process for Universal Orlando. Numerous career types can be searched/applied for online including administration, operations, technical, and entertainment positions. About the Company: Universal Studios is an American film studio with several locations throughout the world. The company’s corporate headquarters are located in New York City, New York. Universal was founded in 1912 and is the oldest film studio in the United States (that is still active). 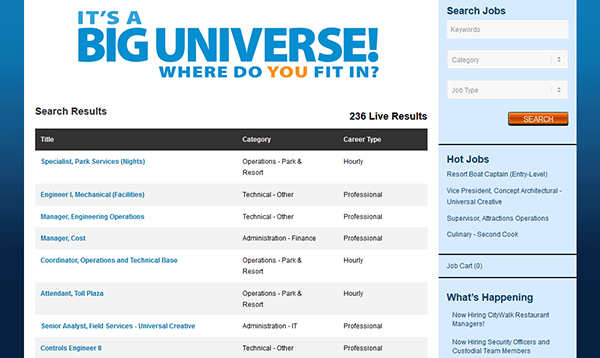 Step 1 – Press this link to open the main careers page in a new browser window/tab. Step 2 – Scroll down the page and enter a keyword into the search field (or select a category from the drop-down list). 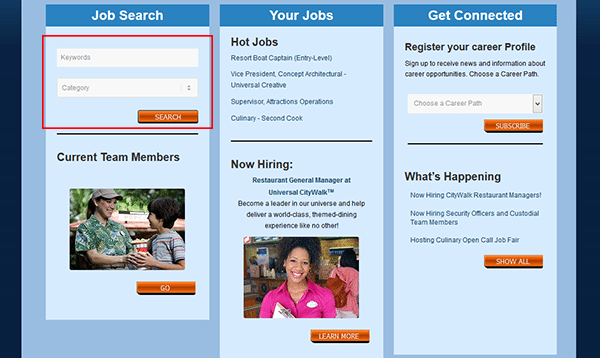 Click the “Search” button to view the list of current openings. Step 3 – The results can be sorted by title, category, or career type. Click the title of the position that you want to start the online hiring process for (to move to the next step). Step 4 – Read the job description to learn more about the position’s responsibilities, qualifications, etc. Click the button as shown in the below image to go to the next section. Note: If you want to apply for more than one job click the “Add to cart” button. Step 5 – Scroll down and press the “Click here” button. 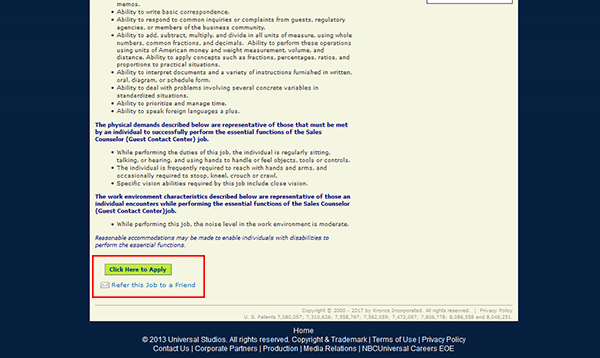 Step 7 – Select if you want to upload a resume or not. 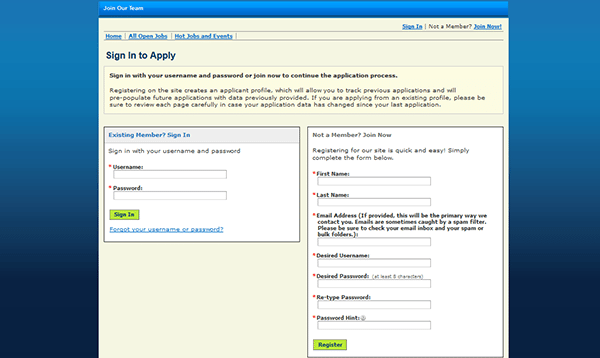 Step 8 – Consent to the terms and conditions.